Comic sketching or comic penciling is drawing cartoon characters to create a comic strip, or a series of related drawings that tell a story. A comic penciling career may start with a simple hobby of drawing cartoon characters that can develop into a fine work of art. Just like singing or dancing, comic pencil sketching can be learned, although those with inborn talent are really the ones who are able to create a lasting career. A comic artist should be able to draw what his eyes see. Some artists are able to copy images but are not able to create their own. Creating images of your own vision can be learned with practice. If you have the talent for drawing, it can be developed for a comic sketching career. To do comic penciling, you should at least know how to draw simple drafts or images of things and people. 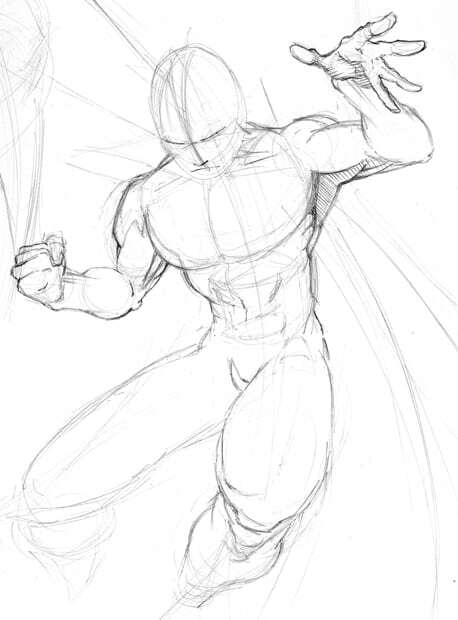 Knowing how to sketch images is a talent, but you need to enhance this talent to begin comic sketching. Those who are planning to create a career in comic pencil sketching should be good at their craft, to say the least. A good comic artist can provide the needed look, pacing and feel of the story. He should be able to create a good comic pencil sketch out of a bad story and turn it into an interesting read. A comic penciller usually works with a writer who creates the story. The comic sketcher then envisions the story and produces a comic strip. Some comic sketchers, on the other hand, create their own stories and draw them to make their own comic strip. 1. Choose the right kind of pencil. One of the most important things to consider when starting with comic pencil sketching is the shade of your pencil. It is the most important tool in comic penciling, so you should be able to choose the best one for you. The ideal pencils to use are those that have a grade of B, 2B and 4B for darker shades. For wood-cased artist’s pencils, the hardest has a grade of 9H while the softest is 9B. Beginners are advised to choose between HB, 2B, 4B, 6B, 2H, or a combination of these shades. Kinds of pencils include wood-cased artists’ pencil, clutch pencils, mechanical pencils, progress pencils, carbon pencils, chalk pencils and pastel pencils.Comic sketchers use different kinds of pencils depending on what they are most comfortable with. Knowing what pencil to use is like knowing the right flavor that suits your taste. 2. Pick the right type of paper. If you cannot seem to find the right shade for your comic pencil sketch, it must be the paper. Some types of paper are too thick or too hard that they do not allow you to apply the right amount of pressure for your drawings. Some types of paper, on the other hand, are too thin. Start with the basic office paper and see if it works for you, or look for other kinds of paper that you may be more comfortable with. Visit an art store and choose the best sketch paper or Bristol pad for your outputs. Place a smooth cardboard or a couple of office paper sheets for a firmer and smoother surface. 3. Gather other supplies. This includes a flat table, sketchbook and a comfortable space where you can work without distractions. Determine the kinds of characters that you want to draw and check out Sunday comics or search for comics online for pictorial references. You do not have to copy the images-you can just get ideas from other comics and apply them to your own. Start sketching out your ideas into comic panels to form a comic strip. 4. Make sure that the images are proportion and consistent. If the way a character looks in your comic strip changes, you will have your readers confused. Be very careful on how the characters look to make them as consistent as possible. Experiment with the motion, gestures and movements of characters. Also experiment with the characters doing different things. Work out on their facial expressions to be able to show different emotions. 5. Create a good layout. Make sure that the flow of the story is not confusing for readers. A good layout makes the readers understand the flow of the story without getting confused somewhere in the comic strip. A comic strip involves sequential drawing that should be able to relay the correct sequence of actions and emotions through your layout. If you are creating a funny comic strip, consider your timing on how to properly throw in the punch lines. 6. This may sound cliche acute, but practice indeed makes perfect. With a lot of practice, you will be able to hone your talent and create your own comic strips. If you are not yet confident about drawing cartoon characters, start by copying comic strips online or from Sunday comics. Once you get a feel of what you want to make, start making your own characters and practice drawing them. It takes a great deal of talent to become a good comic artist. Drawing from your vision and creating unique and memorable characters takes a lot work and thinking. With practice, however, you will be able to create your own characters and apply them on paper. If you are starting with a comic sketching career, take time to learn about the basics of architecture and anatomy. Be as creative as you can and do your best not to focus on one drawing style. Be flexible and try to create pieces that are very different from one another. Show your versatility and learn how to create comic sketches for children and for adults. You should be able to know the difference between children’s and adult’s comics and how to apply them in your comic sketches. Ultimately, comic book sketching is not as easy as people think. It requires high volume of work, creativity, patience and talent. Aspiring cartoonists and comic artists of all ages will welcome DC Comics Guide To Pencilling Comics, an inspirational guide, penned by Klaus Janson, a comic book artist with over thirty years of experience. From creating effective and smooth visual communication sequences to learning about borders and completion processes, DC Comics Guide To Pencilling Comics is filled with examples from Janson’s own successful work. This book appealed to me in its straight forward manner of presenting drawing to a beginner. Johnson has a chatty way of explaining her techniques that makes the excercises fun to do. She has included a broad spectrum of subject matter including animals, buildings, people, etc. I found the book easy to follow and very helpful and would recommend it for any artist’s library.